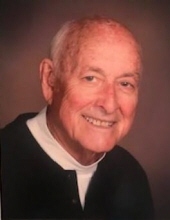 Edwin R. Woods, age 84, of North East Township and Englewood, FL, passed away peacefully on Thursday, February 7, 2019 in Florida. He was born on March 26, 1934 on the family farm in Caney, KY, son of the late Charles and Grace (Steele) Woods. Edwin was a 1952 graduate of Morrow High School in Morrow, OH. He had a full and varied career which included a length of service with NASA. The bulk of his employment, however, was spent with the General Electric Co. from where he retired in 1991. Throughout his personal and professional life, he was a hard-working man who was well-respected by those who worked for him. sports fan and especially enjoyed playing softball. Edwin also enjoyed travelling, playing cards and horseshoes and loved working on his classic cars; always having a Corvette to enjoy. Above all else, his passion was for his family which always came first. He was the patriarch of an adoring family and along with his wife, was always at the center of every family event; whether that be a holiday or one of the grandchildren’s sporting events. In addition to his parents, he was preceded in death by three brothers: Jean, Randy and Howard Woods. Survivors include his high school sweetheart and beloved wife of 64 years, Peggy A. (Perin) Woods; four children: Tim Woods (Janet) of Erie, Kim Love (Mark) of Sunrise, FL, Karrie Biletnikoff (Randy) of Wattsburg and Wendy Chwatek (Jason) of Harborcreek Twp. ; two brothers, Charles David Woods of Louisville, KY and Joe Woods (Babs) of Phoenix, AZ; four sisters-in-law: Mary Ellen Woods, Leta Woods, Gail Woods and Jane Perin; 13 grandchildren: Tricia, Ryan K., Ryan M., Jessica, Paige, Jeff, Julie, Brad, Ashley, Ali, Gracie, Dylan and Tucker; 13 great-grandchildren and several nieces and nephews. Family and friends may call at the Dusckas-Taylor Funeral Home & Cremation Services, Inc., 5151 Buffalo Rd. (at Hannon Rd. in Harborcreek Twp. ), on Thursday from 6 to 8 p.m. and on Friday from 10 a.m. until the time of the funeral service to be conducted there at noon by the Rev. Ted Cole. Edwin will be laid to rest at North East Cemetery. In lieu of flowers or contributions, Edwin would recommend that you spend an extra hour with family or give another hug to a loved one. To send flowers or a remembrance gift to the family of Edwin R. Woods, please visit our Tribute Store. The Funeral Service will be conducted by the Rev. Ted Cole. "Email Address" would like to share the life celebration of Edwin R. Woods. Click on the "link" to go to share a favorite memory or leave a condolence message for the family.